Die Sabbati, videlicet, 23 die Julii. Message from the H. C. for the Lords Concurrence in the following Orders. Gregony, Under Sheriff of Leicester's Petition. Message to the H. C. that Captains Slingsby and Wake are brought up. Smith, Marshal of the Admiralty, authorized to deliver Arms, &c.
E. of Warwick's Letter, that he will use his utmost Vigilance in the Command of the Fleet. From aboard His Majesty's Ship The James, in The Downes, this 21st of July, 1642. 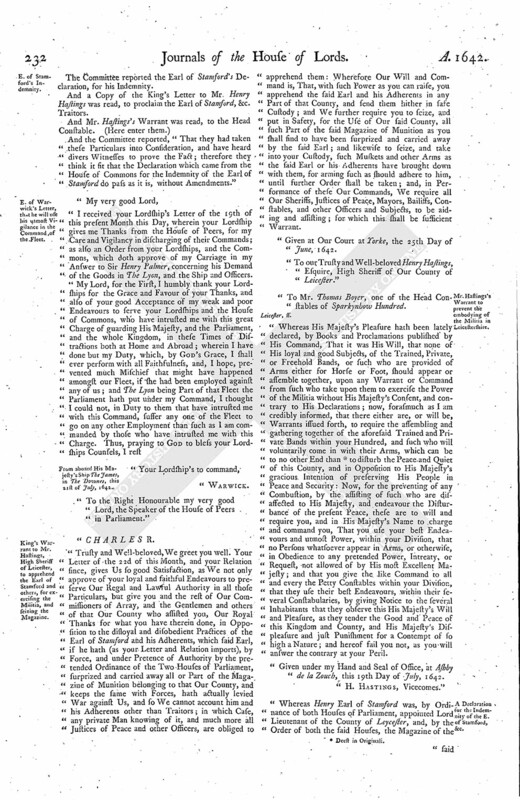 King's Warrant to Mr. Hastings, High Sheriff of Leicester, to apprehend the Earl of Stamford and others, for exercising the Militia, and seizing the Magazine. Mr. Hastings's Warrant to prevent the embodying of the Militia in Leicestershire. A Declaration for the Indemnity of the E. of Stamford, &c.
Order for 4000l. to Maurice Thompson. Committee to prevent the Execution of the Commission of Array in Shropshire, and to recommend the Propositions for raising Horse, etc. there. Sheriff of Devon to pay 100l. Contribution-money to the Dean of Ross. 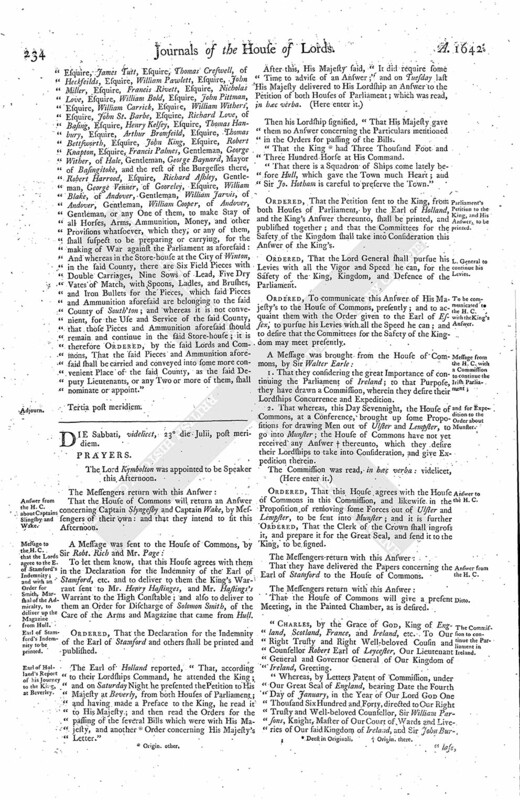 Order to suppress Levies against the Parliament in Hampshire, and to remove the Magazine from Winchester. Answer from the H. C. about Captains Slingsby and Wake. Message to the H. C. that the Lords agree to the E. of Stamford's Indemnity; and with an Order for Smith, Marshal of the Admiralty, to deliver up the Magazine from Hull. 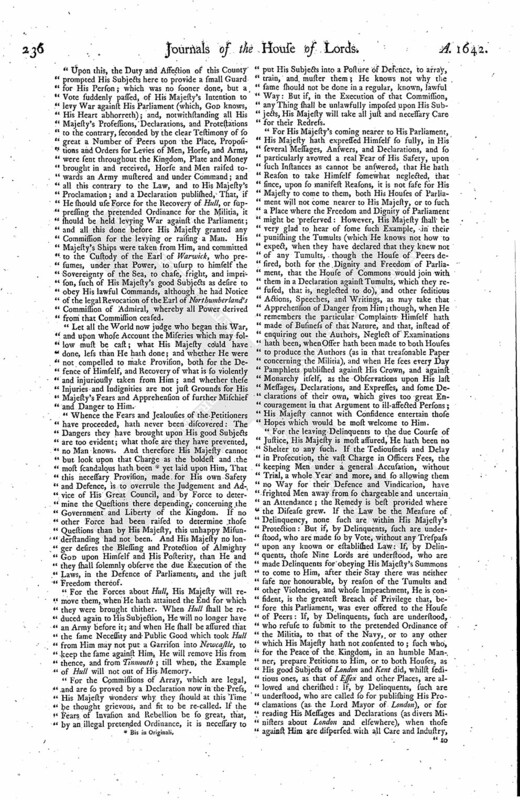 Earl of Stamford's Indemnity to be printed. Earl of Holland's Report of his Journey to the King, at Beverley. 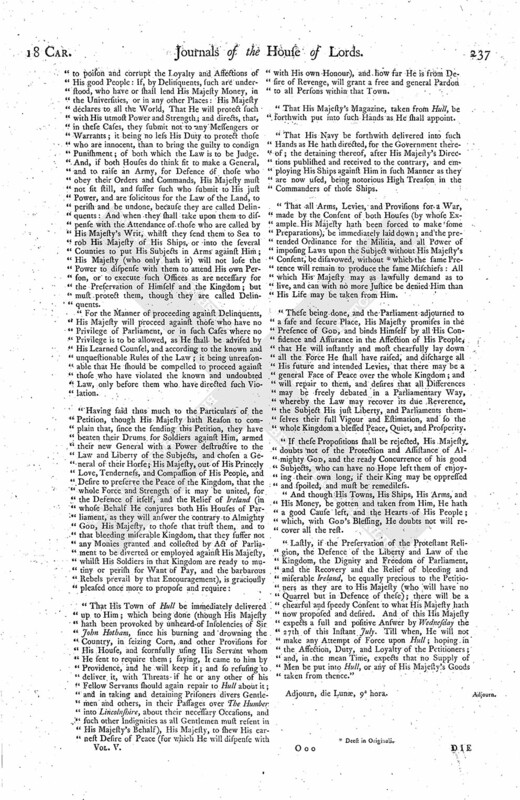 Parliament's Petition to the King, and His Answer, to be printed. L. General to continue his Levies. To be communicated to the H. C. with the King's Answer. and for Expedition to the Order about Munster. The Commission to continue the Parliament in Ireland. His Majesty's Answer to the Parliament's Petition. The Earl of Bollingbrooke is excused for his being absent this Day, being not well. The Messengers were called in, and told, "That this House agrees with the House of Commons in all the Orders now brought up." Upon the Petition of Wm. Gregony, Under Sheriff of Leycestershire; it is Ordered, That the Cause shall be heard on Monday come Sevennight; in the mean Time, he is to attend. To let the House of Commons know, that Captain Slyngsbie and Captain Wake are come, being sent for at their Desire; and that this House intends to sit this Afternoon, at Three of the Clock, and desire them to do the like. 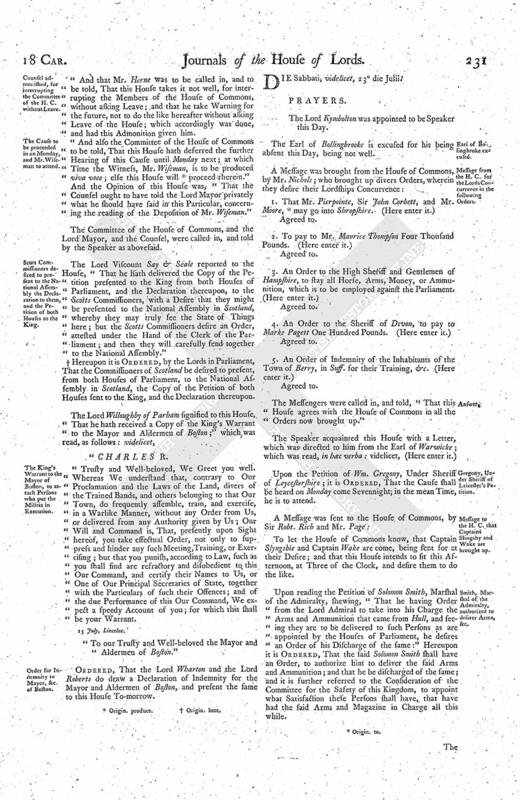 Upon reading the Petition of Solomon Smith, Marshal of the Admiralty, shewing, "That he having Order from the Lord Admiral to take into his Charge the Arms and Ammunition that came from Hull, and seeing they are to be delivered to such Persons as are appointed by the Houses of Parliament, he desires an Order of his Discharge of the same:" Hereupon it is Ordered, That the said Solomon Smith shall have an Order, to authorize him to deliver the said Arms and Ammunition; and that he be discharged of the same; and it is further referred to the Consideration of the Committee for the Safety of this Kingdom, to appoint what Satisfaction these Persons shall have, that have had the said Arms and Magazine in Charge all this while. The Committee reported the Earl of Stamford's Declaration, for his Indemnity. And a Copy of the King's Letter to Mr. Henry Hastings was read, to proclaim the Earl of Stamford, &c. Traitors. And the Committee reported, "That they had taken these Particulars into Consideration, and have heard divers Witnesses to prove the Fact; therefore they think it fit that the Declaration which came from the House of Commons for the Indemnity of the Earl of Stamford do pass as it is, without Amendments." I received your Lordship's Letter of the 19th of this present Month this Day, wherein your Lordship gives me Thanks from the House of Peers, for my Care and Vigilancy in discharging of their Commands; as also an Order from your Lordships, and the Commons, which doth approve of my Carriage in my Answer to Sir Henry Palmer, concerning his Demand of the Goods in The Lyon, and the Ship and Officers. "To the Right Honourable my very good Lord, the Speaker of the House of Peers in Parliament." Trusty and Well-beloved, We greet you well. Your Letter of the 22d of this Month, and your Relation since, gives Us so good Satisfaction, as We not only approve of your loyal and faithful Endeavours to preserve Our Regal and Lawful Authority in all those Particulars, but give you and the rest of Our Commissioners of Array, and the Gentlemen and others of that Our County who assisted you, Our Royal Thanks for what you have therein done, in Opposition to the disloyal and disobedient Practices of the Earl of Stamford and his Adherents, which said Earl, if he hath (as your Letter and Relation imports), by Force, and under Pretence of Authority by the pretended Ordinance of the Two Houses of Parliament, surprized and carried away all or Part of the Magazine of Munition belonging to that Our County, and keeps the same with Forces, hath actually levied War against Us, and so We cannot account him and his Adherents other than Traitors; in which Case, any private Man knowing of it, and much more all Justices of Peace and other Officers, are obliged to apprehend them: Wherefore Our Will and Command is, That, with such Power as you can raise, you apprehend the said Earl and his Adherents in any Part of that County, and send them hither in safe Custody; and We further require you to seize, and put in Safety, for the Use of Our said County, all such Part of the said Magazine of Munition as you shall find to have been surprized and carried away by the said Earl; and likewise to seize, and take into your Custody, such Muskets and other Arms as the said Earl or his Adherents have brought down with them, for arming such as should adhere to him, until further Order shall be taken; and, in Performance of these Our Commands, We require all Our Sheriffs, Justices of Peace, Mayors, Bailiffs, Constables, and other Officers and Subjects, to be aiding and assisting; for which this shall be sufficient Warrant. Given at Our Court at Yorke, the 25th Day of June, 1642. "To our Trusty and Well-beloved Henry Hastings, Esquire, High Sheriff of Our County of Leicester." "To Mr. Thomas Boyer, one of the Head Consables of Sarknhow Hundred. 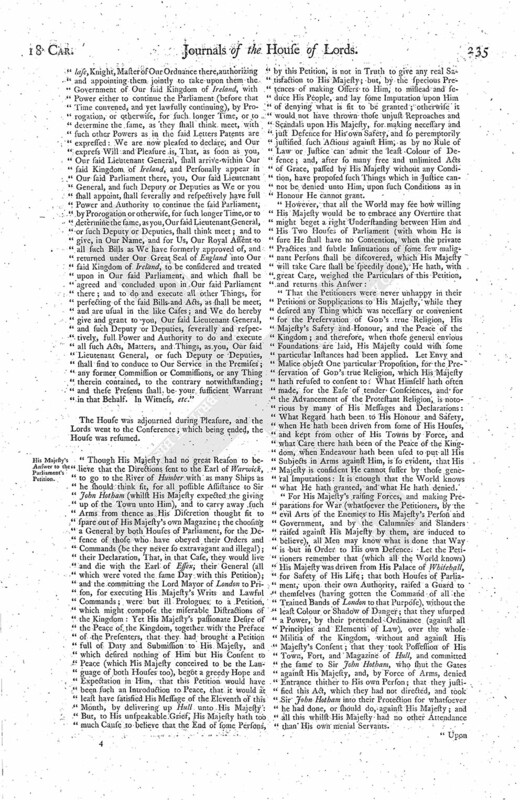 Whereas His Majesty's Pleasure hath been lately declared, by Books and Proclamations published by His Command, That it was His Will, that none of His loyal and good Subjects, of the Trained, Private, or Freehold Bands, or such who are provided of Arms either for Horse or Foot, should appear or assemble together, upon any Warrant or Command from such who take upon them to exercise the Power of the Militia without His Majesty's Consent, and contrary to His Declarations; now, forasmuch as I am credibly informed, that there either are, or will be, Warrants issued forth, to require the assembling and gathering together of the aforesaid Trained and Private Bands within your Hundred, and such who will voluntarily come in with their Arms, which can be to no other End than (fn. 2) to disturb the Peace and Quiet of this County, and in Opposition to His Majesty's gracious Intention of preserving His People in Peace and Security: Now, for the preventing of any Combustion, by the assisting of such who are disaffected to His Majesty, and endeavour the Disturbance of the present Peace, these are to will and require you, and in His Majesty's Name to charge and command you, That you use your best Endeavours and utmost Power, within your Division, that no Persons whatsoever appear in Arms, or otherwise, in Obedience to any pretended Power, Intreaty, or Request, not allowed of by His most Excellent Majesty; and that you give the like Command to all and every the Petty Constables within your Division, that they use their best Endeavours, within their several Constabularies, by giving Notice to the several Inhabitants that they observe this His Majesty's Will and Pleasure, as they tender the Good and Peace of this Kingdom and County, and His Majesty's Displeasure and just Punishment for a Contempt of so high a Nature; and hereof fail you not, as you will answer the contrary at your Peril. Given under my Hand and Seal of Office, at Ashby de la Zouch, this 19th Day of July, 1642. Whereas Henry Earl of Stamford was, by Ordinance of both Houses of Parliament, appointed Lord Lieutenant of the County of Leycester, and, by the Order of both the said Houses, the Magazine of the said County was delivered into his Hands, to be removed or disposed of as he should think fit, for the Safety and Defence of His Majesty and the Country; in Obedience whereunto, the said Earl did take the said Magazine, and did place a great Part thereof at his House at Bradgate, under Safeguard, and the Residue thereof at a Place in The New Warke, near the Town of Leycester; for the doing whereof, the said Earl, and also Wm. Sherman, Wm. Stanley, John Norris, and Wm. Rayner, upon Pretence of being Assistants to the said Earl, and all other his Adherents, were, without all Colour of Law, and against the Rights and Liberties of the Subject, proclaimed Traitors; which, as concerning the said Earl being a Member of the House of Peers, is a high Breach of Privilege of Parliament: Be it therefore Declared, by the said Lords and Commons, That the said Earl, Wm. Sherman, Wm. Stanley, John Norris, Wm. Rayner, nor any other of the Parties which were assisting to the said Earl in the Premises, have done any Thing therein but according to their Duties, and in Obedience to the Commands of both Houses of Parliament; and that therefore the said Earl, and every of them, shall and ought to be protected, by the Power and Authority of both Houses of Parliament: And the said Lords and Commons do hereby forbid all Sheriffs, Mayors, Bailiffs, Constables, and other His Majesty's Officers and Subjects whatsoever, any way to arrest, impeach, molest, or trouble, the said Earl, Wm. Sherman, Wm. Stanley, Jo. Norris, Wm. Rayner, or any of them, or any other of the said Persons so assisting to the said Earl, either in their Persons, Goods, or Estates, for or by reason of the Premises, without the Authority and Consent of both Houses of Parliament." "It is this Day Ordered, by the Lords and Commons, assembled in Parliament, That the Treasurers, appointed to receive the Monies that comes in upon the Act of Subscriptions for Ireland, do forthwith pay unto Maurice Thompson Four Thousand Pounds; and that they shall be re-paid the said Sum out of the Bonds taken at the Custom House." Die Sabbati, 23 Julii, 1642. (fn. 3) Whereas divers well-affected Persons of the Town of Bury St. Edmunds, in the . . . . . Suff. have of themselves, as Voluntiers, under the Leading of Robert Chaplyn, . . . . . . Town, exercised themselves in the Use of their Arms, by peaceably training . . . . . in the Fields near the said Town, the better to enable and prepare themselves . . . . . . . . and Service of His Majesty and this Kingdom, when they shall be lawfully called . . . . . . The Lords and Commons, taking the same into Consideration, do Order, Th . . . . . Persons shall have the Authority of both Houses of Parliament, for their Indemnity, for their said training and exercising already past; . . . . further Ordain, That all such Inhabitants of the said Town, and Lib . . . . . . . as shall desire and willingly submit to be trained and exercis . . . . Use of their Arms, may, from Time to Time hereafter, in a pe . . . . . . orderly Way, under the Leading of John Bright, Gentleman, of the . . Town, assemble themselves in Companies, to train, learn, . . exercise themselves in the Use of their Arms and Order of M . . . . at such convenient Times, and in such Places, in the said Town . . . . . . . . thereof, as shall be by them thought fit for that Purpose, u . . . . . . . shall be herein taken by both Houses of Parliament; and that th . . . . . . . . . harmless for so doing, by the Authority of both Houses . . . . . . . . and that the Aldermen, Justices of the Peace, and Chief Burg . . . . the said Town, and all others that shall encourage and assist . . . . Persons in their training and exercising aforesaid, shall be held . . . . Houses of Parliament to do a very acceptable Service therein, . . . . . have the Authority of both Houses of Parliament for their Indemnity . . . . . . . . and the Aldermen, Justices of Peace, and Chief Burgesses of . . . . . . . . . . hereby required to take special Care for the safe guarding . . . . . . Town, and preserving the Magazine therein; and the said . . . . . . . . the said Voluntiers to be aiding and assisting unto them the . . . . . all Occasions." It is Ordained, by the Lords and Commons, That Mr. Peirepoint, Sir John Corbett, and Mr. More, do forthwith repair into the County of Salop, and possess that County with the Declaration of both Houses concerning the Illegality of the Commission of Array; and that they, together with such others of the said County as they shall think fit to use and employ therein, do propound the Propositions concerning Contribution of Horse, Arms, Money, or Plate, for the Defence of the Kingdom, in the several Parts of that County: And it is further Ordained, That the said Mr. Peirepoint, Sir John Corbet, and Mr. More, shall and may require the Sheriff, and all other Officers, and the Trained Bands, and all other Persons whatsoever in the said County, to preserve the Peace, and to be therein aiding and assisting to the said Mr. Peirepoint, Sir John Corbet, and Mr. More: And it is further Ordained, That they, the said Mr. Peirepont, Sir John Corbett, and Mr. More, shall take Care and provide that the Magazines of the said County be put and kept in Places safe and fit for the preserving of them, for the Peace of the said County." It is this Day Ordered, by the Lords and Commons now assembled in Parliament, That the High Sheriff of the County of Devon do pay unto Marke Pagett, Dean of Rosse, One Hundred Pounds, out of the Contribution-monies for Ireland collected in that County; and that the Receipt of the aforesaid Marke Pagett unto the Sheriff of Devon, and his Return thereof to the Treasurers appointed to receive the Monies that come in upon the Act of Loan and Contribution for Ireland, shall be his sufficient Discharge for the same." 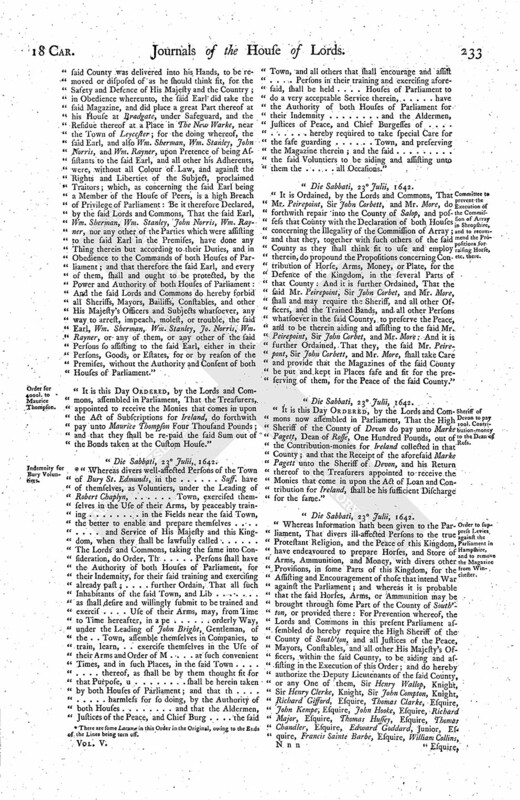 Whereas Information hath been given to the Parliament, That divers ill-affected Persons to the true Protestant Religion, and the Peace of this Kingdom, have endeavoured to prepare Horses, and Store of Arms, Ammunition, and Money, with divers other Provisions, in some Parts of this Kingdom, for the Assisting and Encouragement of those that intend War against the Parliament; and whereas it is probable that the said Horses, Arms, or Ammunition may be brought through some Part of the County of South'ton, or provided there: For Prevention whereof, the Lords and Commons in this present Parliament assembled do hereby require the High Sheriff of the County of South'ton, and all Justices of the Peace, Mayors, Constables, and all other His Majesty's Officers, within the said County, to be aiding and assisting in the Execution of this Order; and do hereby authorize the Deputy Lieutenants of the said County, or any One of them, Sir Henry Wallop, Knight, Sir Henry Clerke, Knight, Sir John Compton, Knight, Richard Gifford, Esquire, Thomas Clarke, Esquire, John Kempe, Esquire, John Hooke, Esquire, Richard Major, Esquire, Thomas Hussey, Esquire, Thomas Chandler, Esquire, Edward Goddard, Junior, Esquire, Francis Sainte Barbe, Esquire, William Collins, Esquire, James Tutt, Esquire, Thomas Creswell, of Heckfeilds, Esquire, William Pawlett, Esquire, John Miller, Esquire, Francis Rivett, Esquire, Nicholas Love, Esquire, William Bold, Esquire, John Pittman, Esquire, William Carrick, Esquire, William Withers, Esquire, John St. Barbe, Esquire, Richard Love, of Basing, Esquire, Henry Kelsey, Esquire, Thomas Hanbury, Esquire, Arthur Bromfeild, Esquire, Thomas Bettsworth, Esquire, John King, Esquire, Robert Knapton, Esquire, Francis Palmes, Gentleman, George Wither, of Hale, Gentleman, George Baynard, Mayor of Basingstoke, and the rest of the Burgesses there, Robert Harrood, Esquire, Richard Ashley, Gentleman, George Venner, of Gooreley, Esquire, William Blake, of Andover, Gentleman, William Jarvis, of Andover, Gentleman, William Cooper, of Andover, Gentleman, or any One of them, to make Stay of all Horses, Arms, Ammunition, Money, and other Provisions whatsoever, which they, or any of them, shall suspect to be preparing or carrying, for the making of War against the Parliament as aforesaid: And whereas in the Store-house at the City of Winton, in the said County, there are Six Field Pieces with Double Carriages, Nine Sows of Lead, Five Dry Vates of Match, with Spoons, Ladles, and Brushes, and Iron Bullets for the Pieces, which said Pieces and Ammunition aforesaid are belonging to the said County of South'ton; and whereas it is not convenient, for the Use and Service of the said County, that those Pieces and Ammunition aforesaid should remain and continue in the said Store-house; it is therefore Ordered, by the said Lords and Commons, That the said Pieces and Ammunition aforesaid shall be carried and conveyed into some more convenient Place of the said County, as the said Deputy Lieutenants, or any Two or more of them, shall nominate or appoint." That the House of Commons will return an Answer concerning Captain Slyngesby and Captain Wake, by Messengers of their own: and that they intend to fit this Afternoon. To let them know, that this House agrees with them in the Declaration for the Indemnity of the Earl of Stamford, etc. and to deliver to them the King's Warrant sent to Mr. Henry Hastinges, and Mr. Hastings's Warrant to the High Constable; and also to deliver to them an Order for Discharge of Solomon Smith, of the Care of the Arms and Magazine that came from Hull. Ordered, That the Declaration for the Indemnity of the Earl of Stamford and others shall be printed and published. The Earl of Holland reported, "That, according to their Lordships Command, he attended the King; and on Saturday Night he presented the Petition to His Majesty at Beverly, from both Houses of Parliament; and having made a Preface to the King, he read it to His Majesty; and then read the Orders for the passing of the several Bills which were with His Majesty, and another (fn. 4) Order concerning His Majesty's Letter." Then his Lordship signified, "That His Majesty gave them no Answer concerning the Particulars mentioned in the Orders for passing of the Bills. That the King (fn. 5) had Three Thousand Foot and Three Hundred Horse at His Command. That there is a Squadron of Ships come lately before Hull, which gave the Town much Heart; and Sir Jo. Hotham is careful to preserve the Town." Ordered, That the Petition sent to the King, from both Houses of Parliament, by the Earl of Holland, and the King's Answer thereunto, shall be printed, and published together; and that the Committees for the Safety of the Kingdom shall take into Consideration this Answer of the King's. Ordered, That the Lord General shall pursue his Levies with all the Vigor and Speed he can, for the Safety of the King, Kingdom, and Defence of the Parliament. Ordered, To communicate this Answer of His Majesty's to the House of Commons, presently; and to acquaint them with the Order given to the Earl of Essex, to pursue his Levies with all the Speed he can; and to desire that the Committees for the Safety of the Kingdom may meet presently. 1. That they considering the great Importance of continuing the Parliament of Ireland; to that Purpose, they have drawn a Commission, wherein they desire their Lordships Concurrence and Expedition. 2. That whereas, this Day Sevennight, the House of Commons, at a Conference, brought up some Propositions for drawing Men out of Ulster and Lempster, to go into Munster; the House of Commons have not yet received any Answer (fn. 6) thereunto, which they desire their Lordships to take into Consideration, and give Expedition therein. Ordered, That this House agrees with the House of Commons in this Commission, and likewise in the Proposition of removing some Forces out of Ulster and Lempster, to be sent into Munster; and it is further Ordered, That the Clerk of the Crown shall ingross it, and prepare it for the Great Seal, and send it to the King, to be signed. That they have delivered the Papers concerning the Earl of Stamford to the House of Commons. "Charles, by the Grace of God, King of England, Scotland, France, and Ireland, etc. To Our Right Trusty and Right Well-beloved Cousin and Counsellor Robert Earl of Leycester, Our Lieutenant General and Governor General of Our Kingdom of Ireland, Greeting. "Whereas, by Letters Patent of Commission, under Our Great Seal of England, bearing Date the Fourth Day of January, in the Year of Our Lord God One Thousand Six Hundred and Forty, directed to Our Right Trusty and Well-beloved Counsellor, Sir William Parsons, Knight, Master of Our Court of Wards and Liveries of Our said Kingdom of Ireland, and Sir John Bur lase, Knight, Master of Our Ordnance there, authorizing and appointing them jointly to take upon them the Government of Our said Kingdom of Ireland, with Power either to continue the Parliament (before that Time convened, and yet lawfully continuing), by Prorogation, or otherwise, for such longer Time, or to determine the same, as they shall think meet, with such other Powers as in the said Letters Patents are expressed: We are now pleased to declare, and Our express Will and Pleasure is, That, as soon as you, Our said Lieutenant General, shall arrive within Our said Kingdom of Ireland, and Personally appear in Our said Parliament there, you, Our said Lieutenant General, and such Deputy or Deputies as We or you shall appoint, shall severally and respectively have full Power and Authority to continue the said Parliament, by Prorogation or otherwise, for such longer Time, or to determine the same, as you, Our said Lieutenant General, or such Deputy or Deputies, shall think meet; and to give, in Our Name, and for Us, Our Royal Assent to all such Bills as We have formerly approved of, and returned under Our Great Seal of England into Our said Kingdom of Ireland, to be considered and treated upon in Our said Parliament, and which shall be agreed and concluded upon in Our said Parliament there; and to do and execute all other Things, for perfecting of the said Bills and Acts, as shall be meet, and are usual in the like Cases; and We do hereby give and grant to you, Our said Lieutenant General, and such Deputy or Deputies, severally and respectively, full Power and Authority to do and execute all such Acts, Matters, and Things, as you, Our said Lieutenant General, or such Deputy or Deputies, shall find to conduce to Our Service in the Premises; any former Commission or Commissions, or any Thing therein contained, to the contrary notwithstanding; and these Presents shall be your sufficient Warrant in that Behalf. In Witness, etc." Though His Majesty had no great Reason to believe that the Directions sent to the Earl of Warwick, to go to the River of Humber with as many Ships as he should think fit, for all possible Assistance to Sir John Hotham (whilst His Majesty expected the giving up of the Town unto Him), and to carry away such Arms from thence as His Discretion thought fit to spare out of His Majesty's own Magazine; the choosing a General by both Houses of Parliament, for the Defence of those who have obeyed their Orders and Commands (be they never so extravagant and illegal); their Declaration, That, in that Case, they would live and die with the Earl of Essex, their General (all which were voted the same Day with this Petition); and the committing the Lord Mayor of London to Prison, for executing His Majesty's Writs and Lawful Commands; were but ill Prologues to a Petition, which might compose the miserable Distractions of the Kingdom: Yet His Majesty's passionate Desire of the Peace of the Kingdom, together with the Preface of the Presenters, that they had brought a Petition full of Duty and Submission to His Majesty, and which desired nothing of Him but His Consent to Peace (which His Majesty conceived to be the Language of both Houses too), begot a greedy Hope and Expectation in Him, that this Petition would have been such an Introduction to Peace, that it would at least have satisfied His Message of the Eleventh of this Month, by delivering up Hull unto His Majesty: But, to His unspeakable Grief, His Majesty hath too much Cause to believe that the End of some Persons, by this Petition, is not in Truth to give any real Satisfaction to His Majesty; but, by the specious Pretences of making Offers to Him, to mislead and seduce His People, and lay some Imputation upon Him of denying what is fit to be granted; otherwise it would not have thrown those unjust Reproaches and Scandals upon His Majesty, for making necessary and just Defence for His own Safety, and so peremptorily justified such Actions against Him, as by no Rule of Law or Justice can admit the least Colour of Defence; and, after so many free and unlimited Acts of Grace, passed by His Majesty without any Condition, have proposed such Things which in Justice cannot be denied unto Him, upon such Conditions as in Honour He cannot grant. That the Petitioners were never unhappy in their Petitions or Supplications to His Majesty, while they desired any Thing which was necessary or convenient for the Preservation of God's true Religion, His Majesty's Safety and Honour, and the Peace of the Kingdom; and therefore, when those general envious Foundations are laid, His Majesty could wish some particular Instances had been applied. Let Envy and Malice object One particular Proposition, for the Preservation of God's true Religion, which His Majesty hath refused to consent to: What Himself hath often made, for the Ease of tender Consciences, and for the Advancement of the Protestant Religion, is notorious by many of His Messages and Declarations: What Regard hath been to His Honour and Safety, when He hath been driven from some of His Houses, and kept from other of His Towns by Force, and what Care there hath been of the Peace of the Kingdom, when Endeavour hath been used to put all His Subjects in Arms against Him, is so evident, that His Majesty is confident He cannot suffer by those general Imputations: It is enough that the World knows what He hath granted, and what He hath denied. For His Majesty's raising Forces, and making Preparations for War (whatsoever the Petitioners, by the evil Arts of the Enemies to His Majesty's Person and Government, and by the Calumnies and Slanders raised against His Majesty by them, are induced to believe), all Men may know what is done that Way is but in Order to His own Defence. Let the Petitioners remember that (which all the World knows) His Majesty was driven from His Palace of Whitehall, for Safety of His Life; that both Houses of Parliament, upon their own Authority, raised a Guard to themselves (having gotten the Command of all the Trained Bands of London to that Purpose), without the least Colour or Shadow of Danger; that they usurped a Power, by their pretended Ordinance (against all Principles and Elements of Law), over the whole Militia of the Kingdom, without and against His Majesty's Consent; that they took Possession of His Town, Fort, and Magazine of Hull, and committed the same to Sir John Hotham, who shut the Gates against His Majesty, and, by Force of Arms, denied Entrance thither to His own Person; that they justified this Act, which they had not directed, and took Sir John Hotham into their Protection for whatsoever he had done, or should do, against His Majesty; and all this whilst His Majesty had no other Attendance than His own menial Servants. Upon this, the Duty and Affection of this County prompted His Subjects here to provide a small Guard for His Person; which was no sooner done, but a Vote suddenly passed, of His Majesty's Intention to levy War against His Parliament (which, God knows, His Heart abhorreth); and, notwithstanding all His Majesty's Professions, Declarations, and Protestations to the contrary, seconded by the clear Testimony of so great a Number of Peers upon the Place, Propositions and Orders for Levies of Men, Horse, and Arms, were sent throughout the Kingdom, Plate and Money brought in and received, Horse and Men raised towards an Army mustered and under Command; and all this contrary to the Law, and to His Majesty's Proclamation; and a Declaration published, That, if He should use Force for the Recovery of Hull, or suppressing the pretended Ordinance for the Militia, it should be held levying War against the Parliament; and all this done before His Majesty granted any Commission for the levying or raising a Man. His Majesty's Ships were taken from Him, and committed to the Custody of the Earl of Warwick, who presumes, under that Power, to usurp to himself the Sovereignty of the Sea, to chase, fright, and imprison, such of His Majesty's good Subjects as desire to obey His lawful Commands, although he had Notice of the legal Revocation of the Earl of Northumberland's Commission of Admiral, whereby all Power derived from that Commission ceased. Let all the World now judge who began this War, and upon whose Account the Miseries which may follow must be cast; what His Majesty could have done, less than He hath done; and whether He were not compelled to make Provision, both for the Defence of Himself, and Recovery of what is so violently and injuriously taken from Him; and whether these Injuries and Indignities are not just Grounds for His Majesty's Fears and Apprehension of further Mischief and Danger to Him. Whence the Fears and Jealousies of the Petitioners have proceeded, hath never been discovered: The Dangers they have brought upon His good Subjects are too evident; what those are they have prevented, no Man knows. And therefore His Majesty cannot but look upon that Charge as the boldest and the most scandalous hath been (fn. 7) yet laid upon Him, That this necessary Provision, made for His own Safety and Defence, is to overrule the Judgement and Advice of His Great Council, and by Force to determine the Questions there depending, concerning the Government and Liberty of the Kingdom. If no other Force had been raised to determine those Questions than by His Majesty, this unhappy Misunderstanding had not been. And His Majesty no longer desires the Blessing and Protection of Almighty God upon Himself and His Posterity, than He and they shall solemnly observe the due Execution of the Laws, in the Defence of Parliaments, and the just Freedom thereof. For the Forces about Hull, His Majesty will remove them, when He hath attained the End for which they were brought thither. When Hull shall be reduced again to His Subjection, He will no longer have an Army before it; and when He shall be assured that the same Necessity and Public Good which took Hull from Him may not put a Garrison into Newcastle, to keep the same against Him, He will remove His from thence, and from Tinmouth; till when, the Example of Hull will not out of His Memory. For the Commissions of Array, which are legal, and are so proved by a Declaration now in the Press, His Majesty wonders why they should at this Time be thought grievous, and fit to be re-called. If the Fears of Invasion and Rebellion be so great, that, by an illegal pretended Ordinance, it is necessary to put His Subjects into a Posture of Defence, to array, train, and muster them; He knows not why the same should not be done in a regular, known, lawful Way: But if, in the Execution of that Commission, any Thing shall be unlawfully imposed upon His Subjects, His Majesty will take all just and necessary Care for their Redress. For His Majesty's coming nearer to His Parliament, His Majesty hath expressed Himself so fully, in His several Messages, Answers, and Declarations, and so particularly avowed a real Fear of His Safety, upon such Instances as cannot be answered, that He hath Reason to take Himself somewhat neglected, that since, upon so manifest Reasons, it is not safe for His Majesty to come to them, both His Houses of Parliament will not come nearer to His Majesty, or to such a Place where the Freedom and Dignity of Parliament might be preserved: However, His Majesty shall be very glad to hear of some such Example, in their punishing the Tumults (which He knows not how to expect, when they have declared that they knew not of any Tumults, though the House of Peers desired, both for the Dignity and Freedom of Parliament, that the House of Commons would join with them in a Declaration against Tumults, which they refused, that is, neglected to do), and other seditious Actions, Speeches, and Writings, as may take that Apprehension of Danger from Him; though, when He remembers the particular Complaints Himself hath made of Business of that Nature, and that, instead of enquiring out the Authors, Neglect of Examinations hath been, when Offer hath been made to both Houses to produce the Authors (as in that treasonable Paper concerning the Militia), and when He sees every Day Pamphlets published against His Crown, and against Monarchy itself, as the Observations upon His last Messages, Declarations, and Expresses, and some Declarations of their own, which gives too great Encouragement in that Argument to ill-affected Persons; His Majesty cannot with Confidence entertain those Hopes which would be most welcome to Him. For the leaving Delinquents to the due Course of Justice, His Majesty is most assured, He hath been no Shelter to any such. If the Tediousness and Delay in Prosecution, the vast Charge in Officers Fees, the keeping Men under a general Accusation, without Trial, a whole Year and more, and so allowing them no Way for their Defence and Vindication, have frighted Men away from so chargeable and uncertain an Attendance; the Remedy is best provided where the Disease grew. If the Law be the Measure of Delinquency, none such are within His Majesty's Protection: But if, by Delinquents, such are understood, who are made so by Vote, without any Trespass upon any known or established Law: If, by Delinquents, those Nine Lords are understood, who are made Delinquents for obeying His Majesty's Summons to come to Him, after their Stay there was neither safe nor honourable, by reason of the Tumults and other Violencies, and whose Impeachment, He is confident, is the greatest Breach of Privilege that, before this Parliament, was ever offered to the House of Peers: If, by Delinquents, such are understood, who refuse to submit to the pretended Ordinance of the Militia, to that of the Navy, or to any other which His Majesty hath not consented to; such who, for the Peace of the Kingdom, in an humble Manner, prepare Petitions to Him, or to both Houses, as His good Subjects of London and Kent did, whilst seditious ones, as that of Essex and other Places, are allowed and cherished: If, by Delinquents, such are understood, who are called so for publishing His Proclamations (as the Lord Mayor of London), or for reading His Messages and Declarations (as divers Ministers about London and elsewhere), when those against Him are dispersed with all Care and Industry, to poison and corrupt the Loyalty and Affections of His good People: If, by Delinquents, such are understood, who have or shall lend His Majesty Money, in the Universities, or in any other Places: His Majesty declares to all the World, That He will protect such with His utmost Power and Strength; and directs, that, in these Cases, they submit not to any Messengers or Warrants; it being no less His Duty to protect those who are innocent, than to bring the guilty to condign Punishment; of both which the Law is to be Judge. And, if both Houses do think fit to make a General, and to raise an Army, for Defence of those who obey their Orders and Commands, His Majesty must not sit still, and suffer such who submit to His just Power, and are solicitous for the Law of the Land, to perish and be undone, because they are called Delinquents: And when they shall take upon them to dispense with the Attendance of those who are called by His Majesty's Writ, whilst they send them to Sea to rob His Majesty of His Ships, or into the several Counties to put His Subjects in Arms against Him; His Majesty (who only hath it) will not lose the Power to dispense with them to attend His own Person, or to execute such Offices as are necessary for the Preservation of Himself and the Kingdom; but must protect them, though they are called Delinquents. For the Manner of proceeding against Delinquents, His Majesty will proceed against those who have no Privilege of Parliament, or in such Cases where no Privilege is to be allowed, as He shall be advised by His Learned Counsel, and according to the known and unquestionable Rules of the Law; it being unreasonable that He should be compelled to proceed against those who have violated the known and undoubted Law, only before them who have directed such Violation. That His Town of Hull be immediately delivered up to Him; which being done (though His Majesty hath been provoked by unheard-of Insolencies of Sir John Hotham, since his burning and drowning the Country, in seizing Corn, and other Provisions for His House, and scornfully using His Servant whom He sent to require them; saying, It came to him by Providence, and he will keep it; and so refusing to deliver it, with Threats if he or any other of his Fellow Servants should again repair to Hull about it; and in taking and detaining Prisoners divers Gentlemen and others, in their Passages over The Humber into Lincolnshire, about their necessary Occasions, and such other Indignities as all Gentlemen must resent in His Majesty's Behalf), His Majesty, to shew His earnest Desire of Peace (for which He will dispense with with His own Honour), and how far He is from Desire of Revenge, will grant a free and general Pardon to all Persons within that Town. That His Majesty's Magazine, taken from Hull, be forthwith put into such Hands as He shall appoint. That His Navy be forthwith delivered into such Hands as He hath directed, for the Government thereof; the detaining thereof, after His Majesty's Directions published and received to the contrary, and employing His Ships against Him in such Manner as they are now used, being notorious High Treason in the Commanders of those Ships. That all Arms, Levies, and Provisions for a War, made by the Consent of both Houses (by whose Example His Majesty hath been forced to make some Preparations), be immediately laid down; and the pretended Ordinance for the Militia, and all Power of imposing Laws upon the Subject without His Majesty's Consent, be disavowed, without (fn. 8) which the same Pretence will remain to produce the same Mischiefs: All which His Majesty may as lawfully demand as to live, and can with no more Justice be denied Him than His Life may be taken from Him. These being done, and the Parliament adjourned to a safe and secure Place, His Majesty promises in the Presence of God, and binds Himself by all His Confidence and Assurance in the Affection of His People, that He will instantly and most chearfully lay down all the Force He shall have raised, and discharge all His future and intended Levies, that there may be a general Face of Peace over the whole Kingdom; and will repair to them, and desires that all Differences may be freely debated in a Parliamentary Way, whereby the Law may recover its due Reverence, the Subject His just Liberty, and Parliaments themselves their full Vigour and Estimation, and so the whole Kingdom a blessed Peace, Quiet, and Prosperity. If these Propositions shall be rejected, His Majesty doubts not of the Protection and Assistance of Almighty God, and the ready Concurrence of his good Subjects, who can have no Hope left them of enjoying their own long, if their King may be oppressed and spoiled, and must be remediless. And though His Towns, His Ships, His Arms, and His Money, be gotten and taken from Him, He hath a good Cause left, and the Hearts of His People; which, with God's Blessing, He doubts not will recover all the rest. "Lastly, if the Preservation of the Protestant Religion, the Defence of the Liberty and Law of the Kingdom, the Dignity and Freedom of Parliament, and the Recovery and the Relief of bleeding and miserable Ireland, be equally precious to the Petitioners as they are to His Majesty (who will have no Quarrel but in Defence of these); there will be a chearful and speedy Consent to what His Majesty hath now proposed and desired. And of this His Majesty expects a full and positive Answer by Wednesday the 27th of this Instant July. Till when, He will not make any Attempt of Force upon Hull; hoping in the Affection, Duty, and Loyalty of the Petitioners; and, in the mean Time, expects that no Supply of Men be put into Hull, or any of His Majesty's Goods taken from thence." Adjourn, die Lunæ, 9a hora. 3. There are some Lacunæ in this Order in the Original, owing to the Ends of the Lines being torn off.